EvelineCharles Beauty MD offers PRP Vampire Facelift and PRP Combined with Microneedling in Edmonton and Calgary. Experience the Power of PRP or the Vampire Facelift! If you’re looking for the fountain of youth you may not have to go far. The key to turning back the clock may very well be found in your own blood. More specifically, the platelet rich plasma (PRP) contained therein, called “liquid gold” by some doctors, is made up of fundamental protein growth factors which aid with cell growth, skin tissue repair and collagen production. It has also been used to stimulate hair growth. When PRP is combined with Microneedling, the results are dramatic and can be seen after only one treatment! What is microneedling? 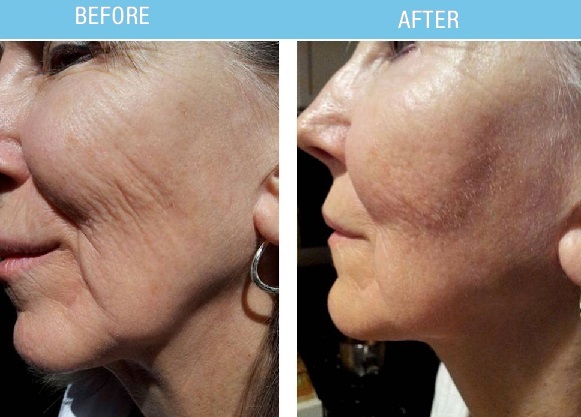 This minimally invasive technique involves a series of tiny, very fine needles which are passed over the skin, creating micro-injuries which trigger new collagen and elastin synthesis as the skin begins to naturally repair itself. These micro-injuries also create channels that allow various substances – serums or your own plasma – to penetrate deeper into the skin resulting in better product efficacy. The result is improved skin tone and texture, reduction of acne scars and stretch marks, tightened skin, and softened lines and pores. Request a consultation with a Beauty MD Image Consultant to learn more about PRP Combination Therapy by calling 780-424-5666 (Edmonton Locations) or 403-571-5666 (Calgary Locations). Currently available at all locations. Call to book in for your complimentary consultation. Why Do Platelets Rejuvenate the Skin? Platelets are the cells in the blood that help tissue to heal and grow new cells. The Platelet Rich Plasma activates the stem cells that lie dormant in the skin on the face through certain growth factors found in the platelets. When injected into specific for dealing with problems in specific, defined areas of the skin, promotes your own collagen to grow, regenerates tissue, and thus acts as to naturally smooth and tighten the skin. In this way, PRP softens wrinkles and creating smoother skin texture and tone. A small amount of blood will be drawn from you. While the PRP is being prepared, your skin will be cleansed and prepared for the treatment. The injections take a few moments and are only mildly uncomfortable. The procedure is quick (15 minutes total), relatively painless, and requires no post-procedure care or time off from daily events. Mild swelling, redness, or bruising fades within 1-3 days. The PRP is made from your own cells, virtually eliminating the possibility of negative side effects. How Does PRP Differ from Soft Tissue Filler? Hyaluronic acid fillers are composed of a solid material that fills lines and skin folds. These fillers are indicated to soften deeper lines such as the folds around the mouth area or to increase lips’ volume. PRP stimulates your own collagen to grow for total facial rejuvenation rather than individual wrinkle improvement; therefore, it improves the skin tone, tightness, and texture. Dermal fillers can be used with PRP, as the two types of treatments are meant for different purposes; they supplement each other to give the best final outcome of a more youthful looking face. Hyaluronic acid fills specific lines and folds; PRP improves overall volume, fullness, and skin tone. PRP acts to improve overall quality, tightness, and texture of the skin rather than filling individual deeper wrinkles. The goal of PRP skin rejuvenation therapy is to improve skin tone and texture, tighten skin, and soften lines and pores. Results begin to show 1-2 weeks after the treatment session and continue to improve with time. Three or more sessions are required for maximum results. $2400 for 3 sessions. Treatment is scheduled every 3-4 weeks to achieve desired result. For hair loss treatment, we recommend 6+ sessions.